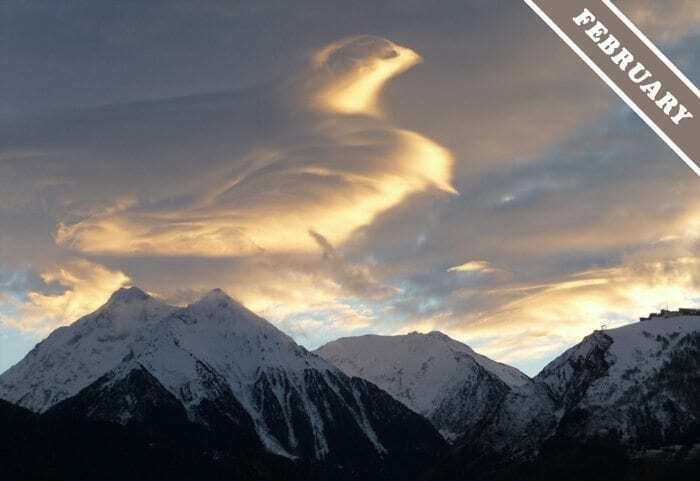 No, it’s an Altocumulus lenticularis – in the shape of a bird. Or a plane. Philippe Villette photographed February’s Cloud of the Month at sunset over the Aure Valley in the French Pyrenees. He described his cloud as a bird coming in to land. Others have have suggested it is more like a jet aircraft. No one has yet claimed this classic example of the lenticularis cloud species looks like Superman. In my humble opinion it is very definitely a bird, it even has it’s feet down ready to make a nice soft landing. THAT is a “WOW” cloud!!! Or is it a Phoenix rising…like every cloud…awesome and in flight! it is so spectacular,really like a species of birds! Cool,i dont see this cloud ever before!